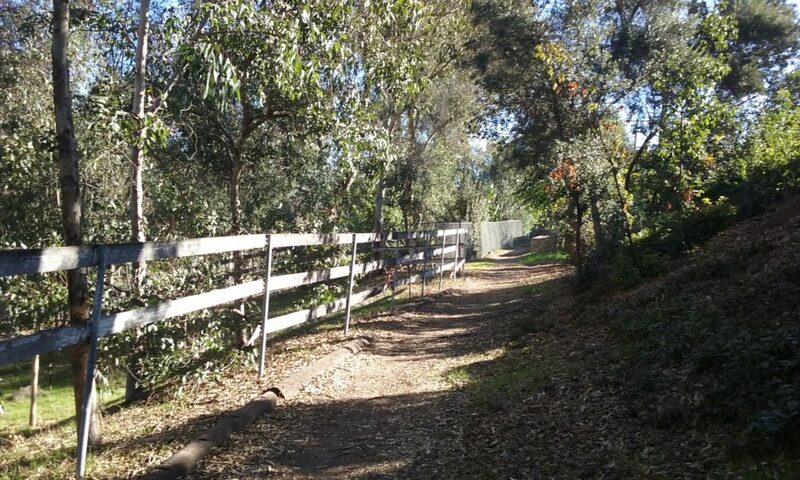 Horse Alley is a path from Juanita Cooke Trail to Euclid that roughly parallels the Hiltscher Trail. It is an inconsistent trail in that some places are wide, other places narrow and a terrain that has you stepping over roots or walking on bark. Then there’s the smell. You really feel away from the city here and why horse is in the name. It’s where the backyards of large properties touch; hence the word alley in the name. Described in this webpage are two loops that use Horse Alley as the base leg. Although this trail is on the map, there is no entrance sign for it. The picture below shows that the start is merely an open gate to the much larger Juanita Cooke Trail. Parking is OK on Valencia Mesa and there’s plenty of parking beyond the bridge too. In the middle of the picture is the path that leads down to the Juanita Cooke Trail. 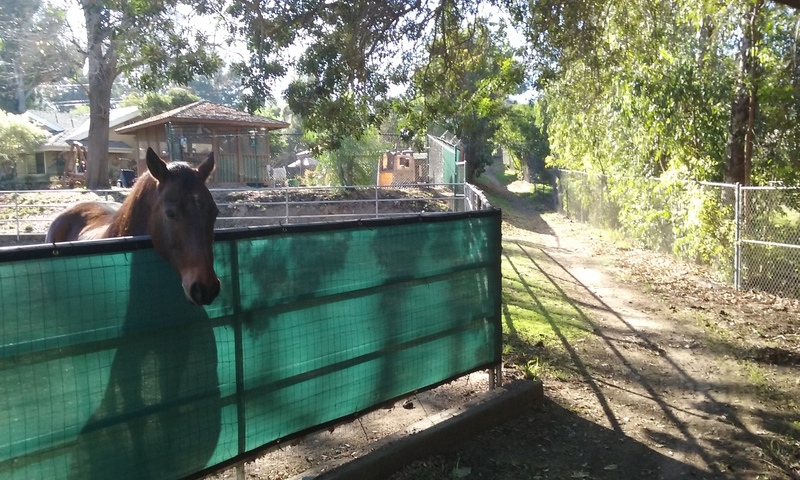 Parking for Both Horse Alley Loops is along Valencia Mesa near the bridge that crosses over the Juanita Cooke Trail. Valencia Mesa is parallel to Chapman and about a mile north. Take either Euclid or Harbor to Valencia Mesa. The bridge near where you will park is .3 miles from Harbor and .6 mi from Euclid. (The parking lot that is right next to the trail is only for patients of the medical center there.) After parking somewhere on Valencia Mesa, find your way to the north-east edge of the bridge. That’s where there’s a trail down to the Juanita Cooke. Continue north for about 200 yards. The picture above shows the open gate. Horse Alley may be named after this guy who you will see shortly after entering the trail. The North Loop (1.8 mi) involves Horse Alley and a trail on the other side of Bastanchury. Horse Alley is a quiet very hidden trail and somewhat disconcerting in that you constantly feel like you shouldn’t be there. All about you are backyards; no streets, not even a driveway with cars. You will see goats, chickens and horses kept as pets. There is one place on Horse Alley where you will feel totally lost without this –> picture. You will emerge on Euclid where you should see the tunnel that goes under Bastanchury. You can use the tunnel if you want. Otherwise cross normally to the other side and beyond the animal hospital. 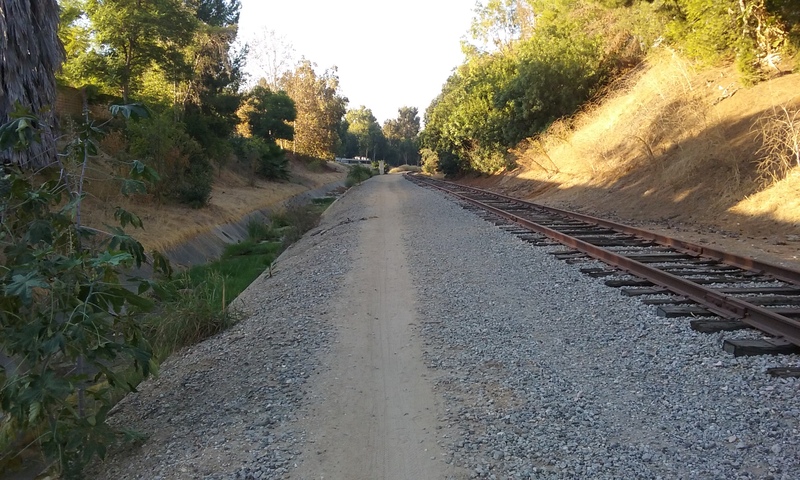 The abandoned Union Pacific line to the left is another walk described in –> Bastanchury Park Trail but for the Horse Alley Loop you will be going right (north) so you can get on the Juanita Cooke back to where you started. Emerging from Horse Alley on Euclid and looking north you can see the tunnel that goes under Bastanchury. _____Continuing north on the trail behind the stables, you will be walking between the railroad tracks and Bastanchury. Pretty noisy; quite a contrast with Horse Alley. A half mile beyond Euclid, Bastanchury curves to the right whereas the trail and the creek bed follows the tracks to the left. You will eventually come back into civilization at Laguna Road. Go uphill for a short ways and then right on Morelia. Morelia is about a block long and if you look on a map you can see it taking the place of what should be the Juanita Cooke Trail. Cross Bastanchury at the light and go up the zig-zag path to the Juanita Cooke Trail. Once on top you will recognize where you entered Horse Alley. If you are interested in local archeology, the replacement of the Juanita Cooke Trail with this short street (Morelia) is an interesting story although somewhat speculative. The Juanita Cooke is the remnants of the Pacific Electric (the Red Car line) through Fullerton. You’d think that there would have been a bridge at Bastanchury just as there was a bridge in two other places less than a mile from here. Instead we have a zig-zag path down to Bastanchury, then a street (Morelia Ave.) that goes up hill to the level where the Juanita Cook continues. There never was a bridge because Bastanchury Blvd didn’t show up until as late as 1962. 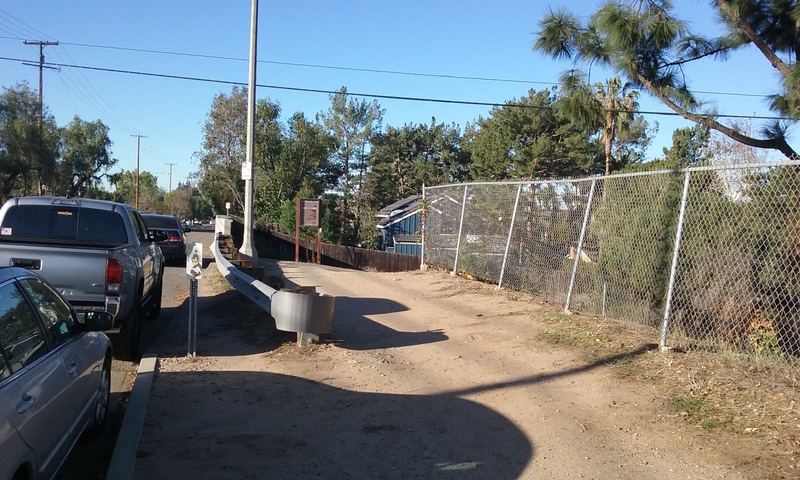 The level of land that is now Morelia Ave. was as high as the top of the zig-zag path. For some reason it was found necessary to make Bastanchury lower there. Morelia then had to meet it down there. A very old map in the history room of the Fullerton Library shows a Santa Fe spur paralleling where Bastanchury Road would be some 40 years in the future. But apparently they didn’t exactly overlay each other. The Santa Fe may have been about 100 feet south. That way the Santa Fe could make a surface crossing with the Pacific Electric. Note the trail warn-in by thousands of bicycles over the years. Thank you bikers. To the left is a picture of the trail after it (and the track) pulled away from Bastanchury Blvd. Note how wide this trail will be if the tracks and road bed were removed. 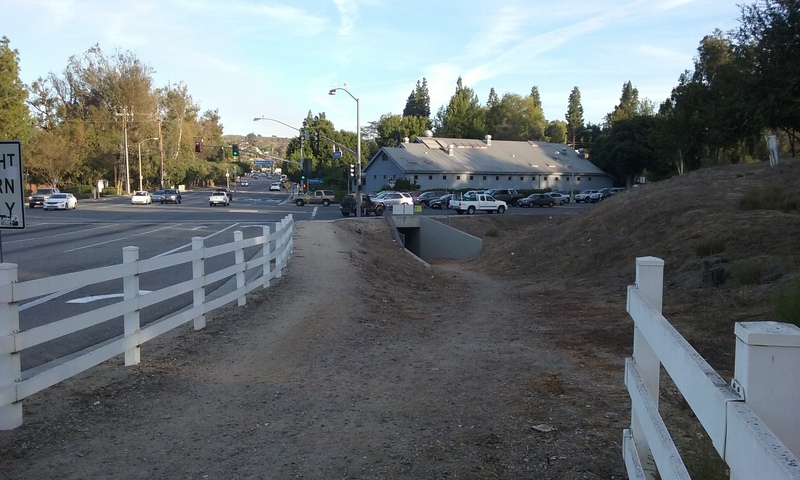 This right-of-way is that wide through most of Fullerton. It is narrower north of Fullerton where it passes Imperial and curves west and goes clear into L.A. Wouldn’t that be wonderful; a bike/walking trail from Fullerton to L.A. Note the creek bed. That follows the road bed for quite a ways which means the trail will be naturally green. Wow. A one mile long park, not just a trail. Below is the Horse Alley north loop map. 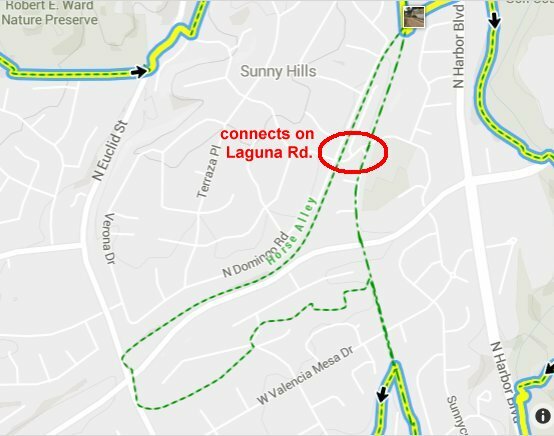 Note there is a red oval around Laguna Rd and Morelia Ave. The short loop described above had you taking Morelia back to the Juanita Cooke where you entered Horse Alley. Notice on the map that the trail you were on as well as the Juanita Cooke Trail both go north east. These two abandoned rail lines are –for quite a ways– only about 100 feet apart. So instead of taking Morelia back to the Juanita Cooke, you can continue on the abandoned line you were on until you get to the bridge. Go under the bridge to find the ramp up to the Juanita Cooke. You will walk back to Morelia as before and then back to where you entered Horse Alley. This extra trip adds .6 mile to the 1.8 mi loop described above. Within the red circle is Morelia and Laguna Road. You can close the loop there or go on to the railroad bridge. There’s Another Place to Park as shown on the map to the right. Park on Morelia Ave or Laguna Rd (within the red oval). From there you can do the north loop described above. It is also a good starting place for taking either of the abandoned rail trails out-and-back north as far as you want. The Juanita Cooke (the higher one, the east one) goes straight as an arrow north. It goes past Laguna Lake and then to the Walmart parking lot on Imperial. 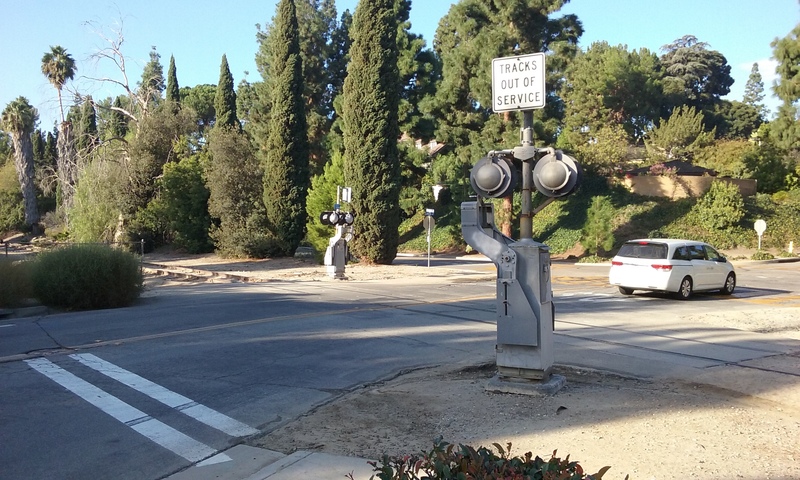 The lower one, the one with the tracks still in place, separates from the other one and goes past Fullerton Golf Course, San Juan Park and Hermosa Park. Hermosa Drive links the two abandoned rail lines at the north end and red loop to the right shows where the paths join at the south end making a very nice Railroad Loop. 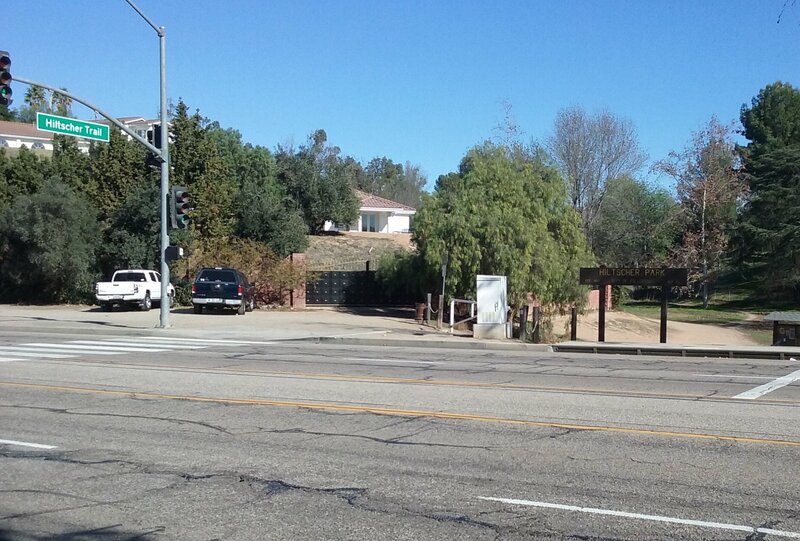 ____The potential for a bike/walking trail from Fullerton to Los Angeles has real possibilities here. We have two abandoned lines that go that way. That means twice the chance that this could come true. Garden of Weeden near the south end of the Hiltscher Park Trail. The Valencia Mesa Bridge is in the background. The South Loop (2.2 mi) The south loop can start in the same way as the north loop described above. (On Valencia Mesa then walking a short distance north on Juanita Cooke). The only tricky part of Horse Alley is made clear with this –> picture. When you arrive at Euclid, instead of continuing north through the tunnel, walk uphill along Euclid for about .4 mile to Hiltscher Park Trail. Taking that trail east will put you back on the Juanita Cooke Trail and the Garden of Weeden. From there, looking north you can see the Valencia Mesa bridge where your car is parked. The Hiltscher Park Trail <– has its own webpage. Hiltscher Park Entrance on Euclid. Parking for about 6 cars. The South Loop if you start here goes up to the Juanita Cooke, to the left 1/4 mile then back down through Horse Alley to Euclid. The South Loop (2.2 mi) with Easier Parking Since this loop includes Hiltscher Trail, you might as well take advantage of the parking there. (There’s room for six cars but if all places are taken do a U-turn and park on Valley view.) Walk the Hiltscher Trail to Juanita Cooke. 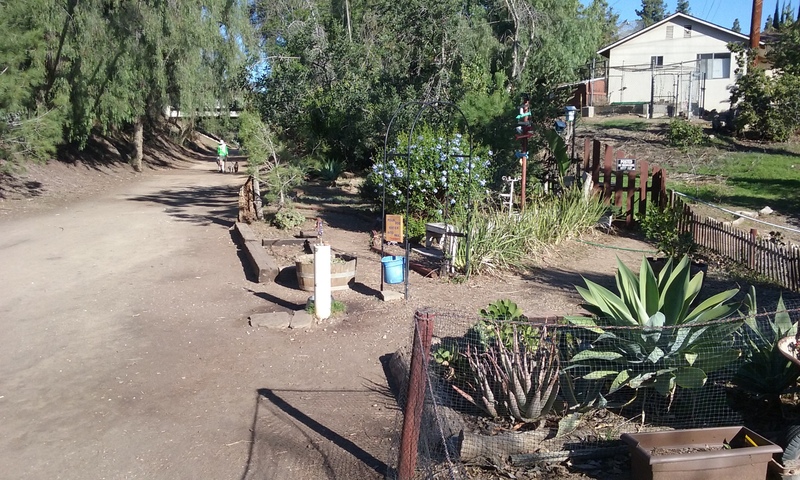 (Get a drink of water at Garden of Weeden) and then walk about a hundred yards to the entrance gate of Horse Alley. (The only hard part is cleared up with this –> picture.) After passing through Horse Alley, walk uphill along Euclid for about .4 mile to where you parked your car. This is where the abandoned U-P line trail meets Laguna Rd. If a parking lot could be made here, this place would become a hub for four trail loops. More winter color along the way. The rustic fences along the way are all different. That’s because they are the back fence of the home owners. 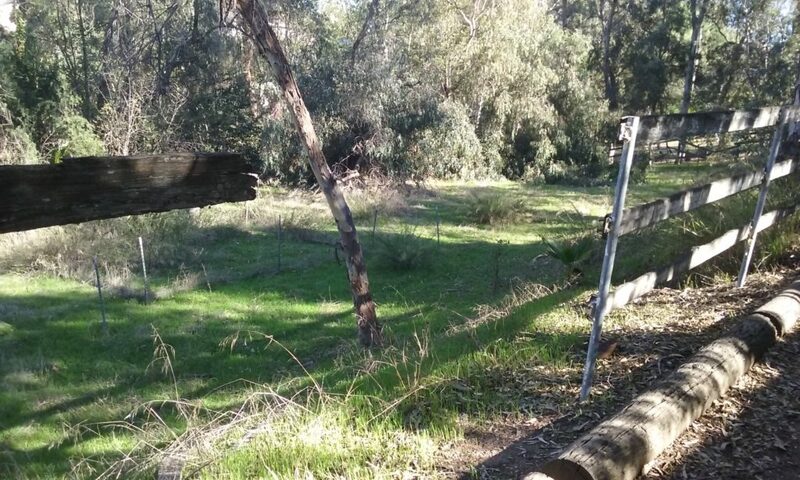 Not the fence of the trail. 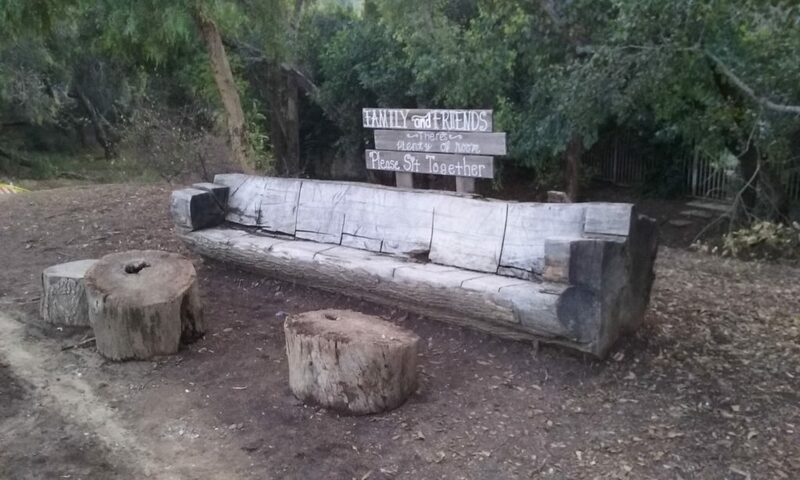 Log bench near Garden of Weeden. Someday when the Rails to Trails comes to Fullerton again, the space along Laguna Road between Domingo Rd and Morelia can be made into a mini park with a place for parking. 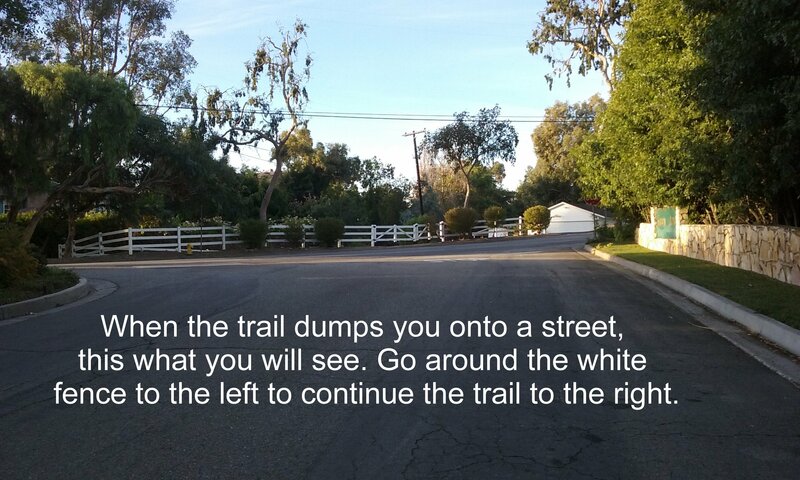 This would then be an excellent reference point (for starting and ending) two trails in four directions. It’s not just access to two trails, but access to the centers of them for long out-and-back walks. And there’s also two trail loops pass through here.